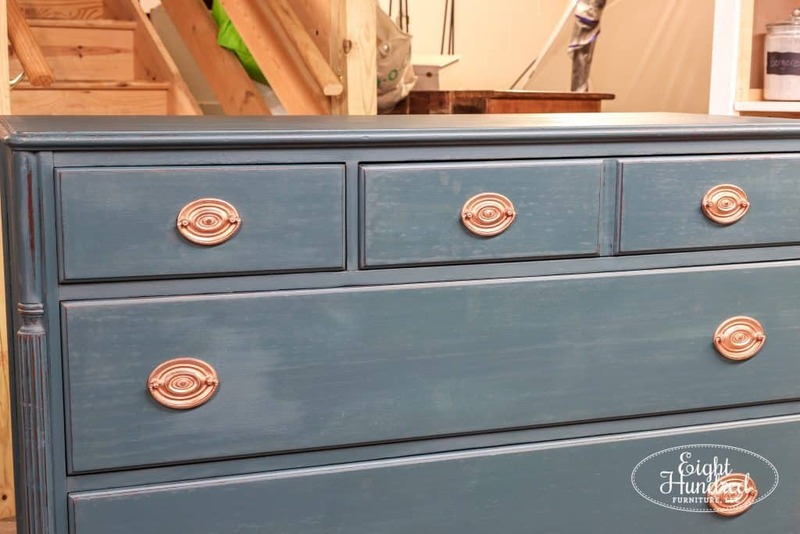 My mahogany dresser is all finished and it was such a blast to refinish! This piece challenged me as a painter and it drew me into a style that I don’t typically gravitate towards. 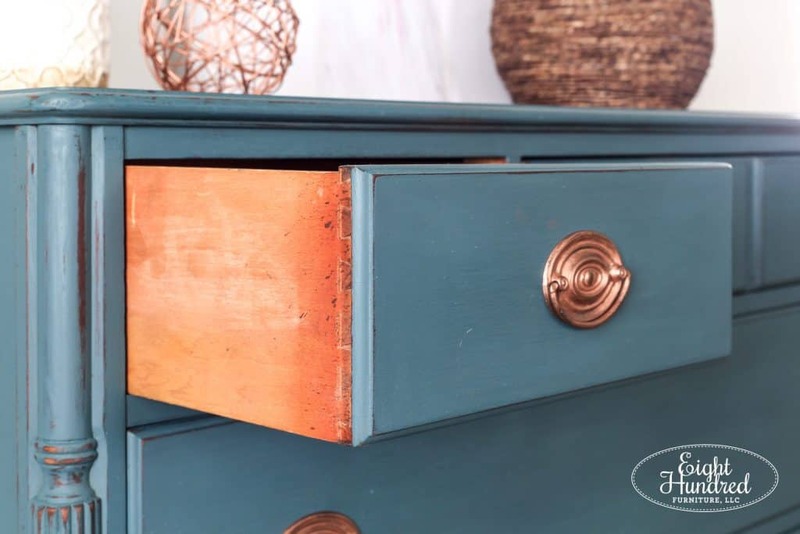 It gave me the opportunity to experiment with mixing paint colors and break out my copper metallic wax. Plus, it’s really really pretty! 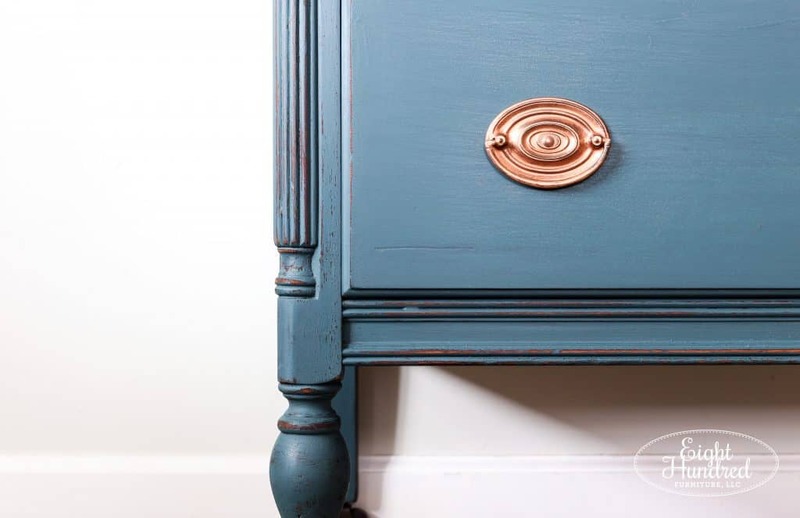 The color is a custom mix of 2 parts Flow Blue, 1 part Artissimo and 1 part Boxwood by Miss Mustard Seed’s Milk Paint. 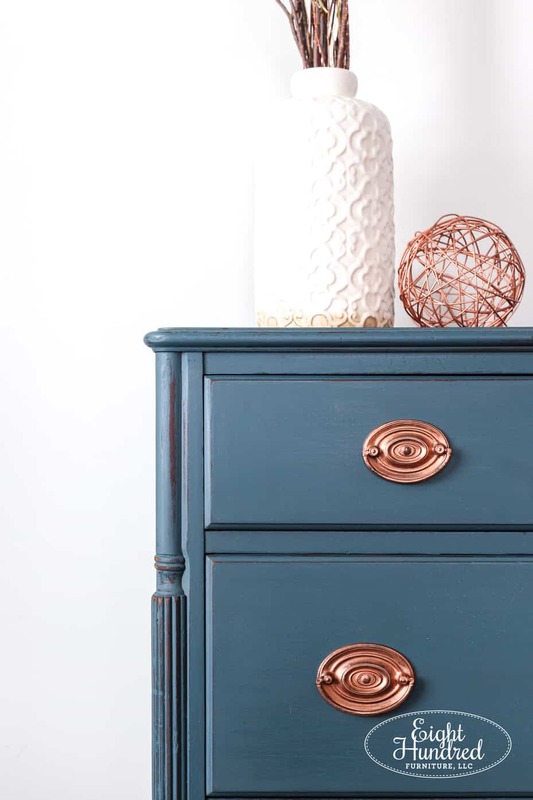 I had shared my doubts about my color choice on this piece, but once I moved into the finishing process, it came together beautifully. 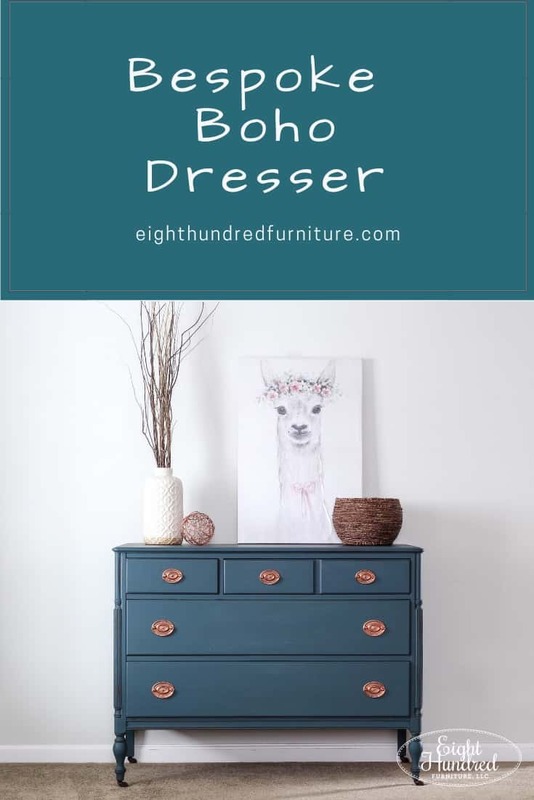 The dresser sat against my staging wall for a few days while the Hemp Oil topcoat cured, and I set out to compile staging props that would compliment this boho style dresser. 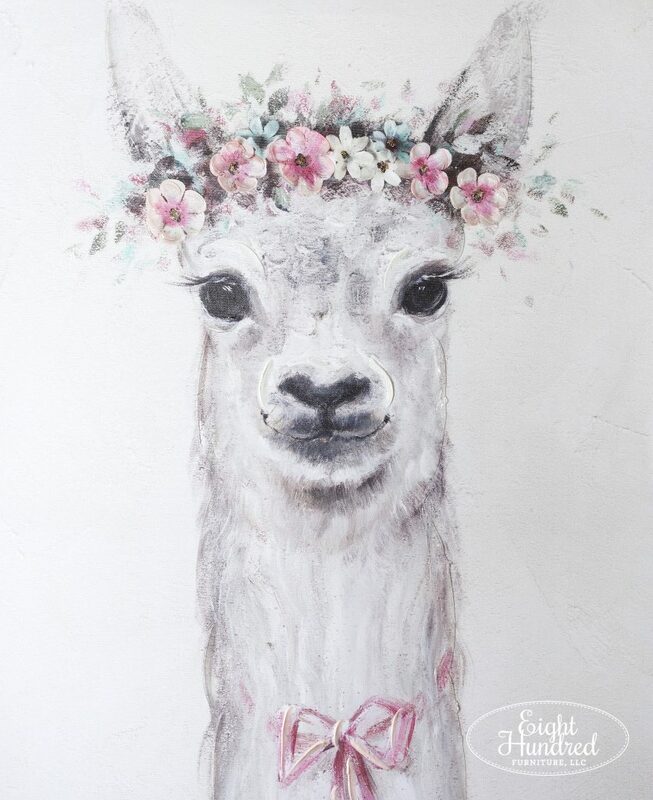 I stopped into my local Hobby Lobby to find some goodies and I’ll be honest, I had to put my blinders on and keep repeating “think boho…think boho” to myself. 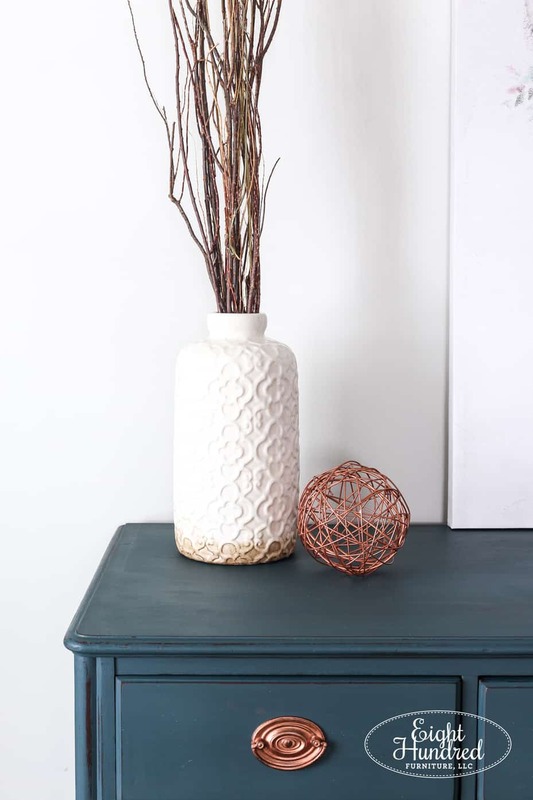 I’m such a fan of farmhouse and classic accents that it was difficult to immerse myself into the world of modern shapes, clean lines and natural textures. 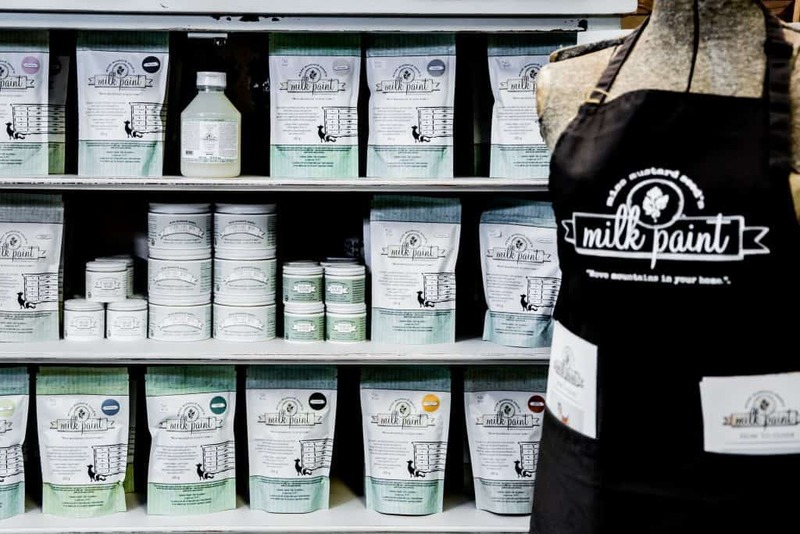 My hands kept picking up pictures of cows and white ceramic milk pitchers! I had a vision of a large piece of art on one side with a vase on the other with some wild branches peeking out. 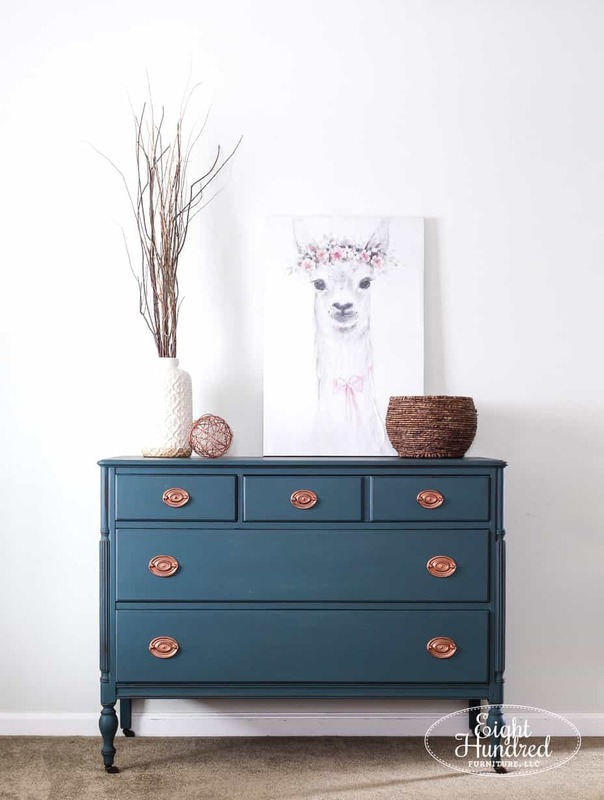 For inspiration, I scrolled through the feeds of fellow furniture painters like The Turquoise Iris and Finn + Bo. 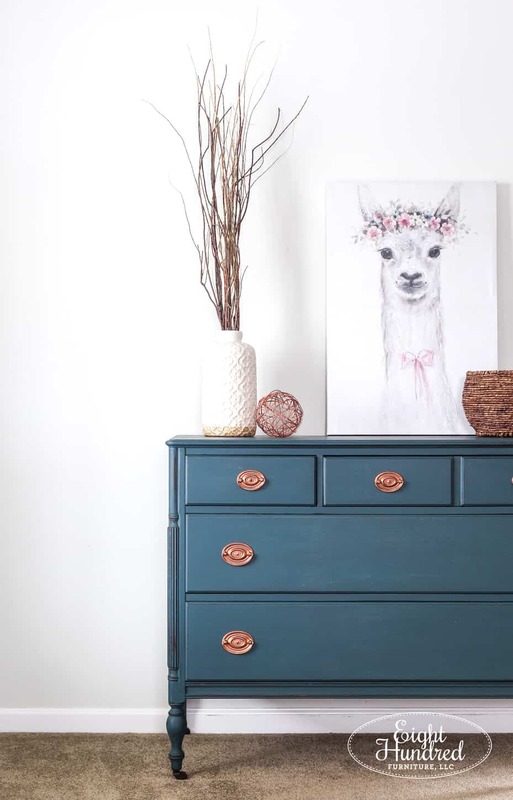 I didn’t copy from them 100%, but I needed to get my head into the right design mode by constantly studying their staging so I wouldn’t go down the farmhouse decor rabbit hole again. So what do you think? Are you feeling the boho vibes? 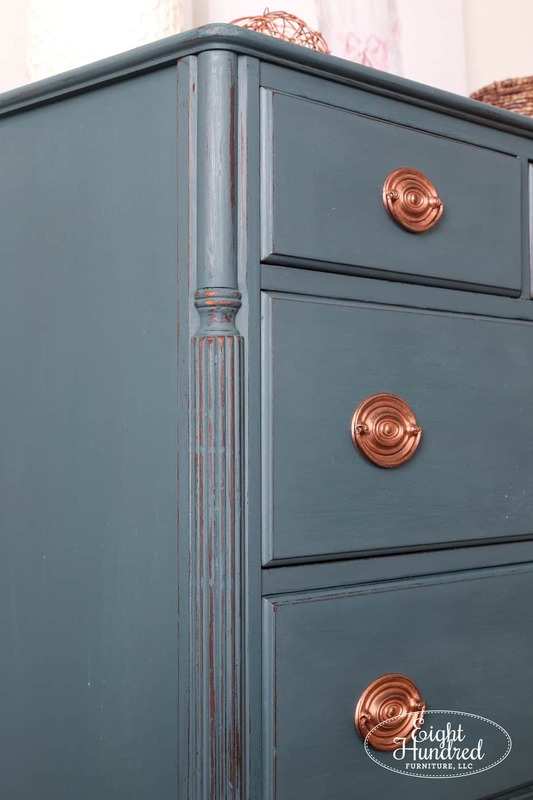 I absolutely love how this paint color plays with copper metal accents. They’re a perfect match! That Rub ‘n Buff is good stuff! 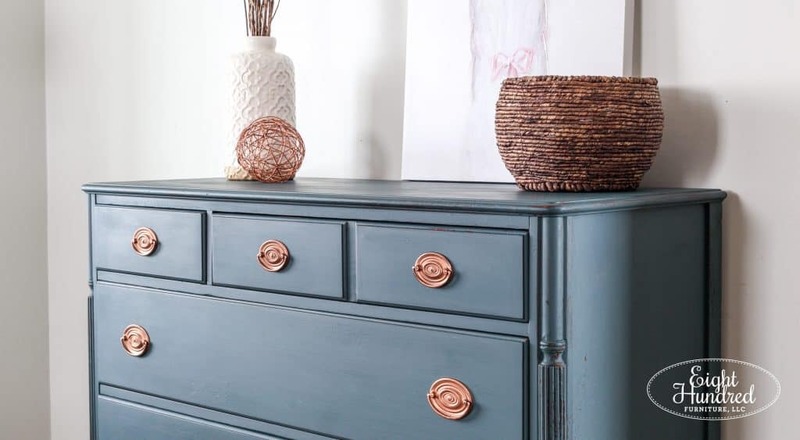 The classic lines on this dresser provide structure that grounds the more whimsical elements that I used to stage. 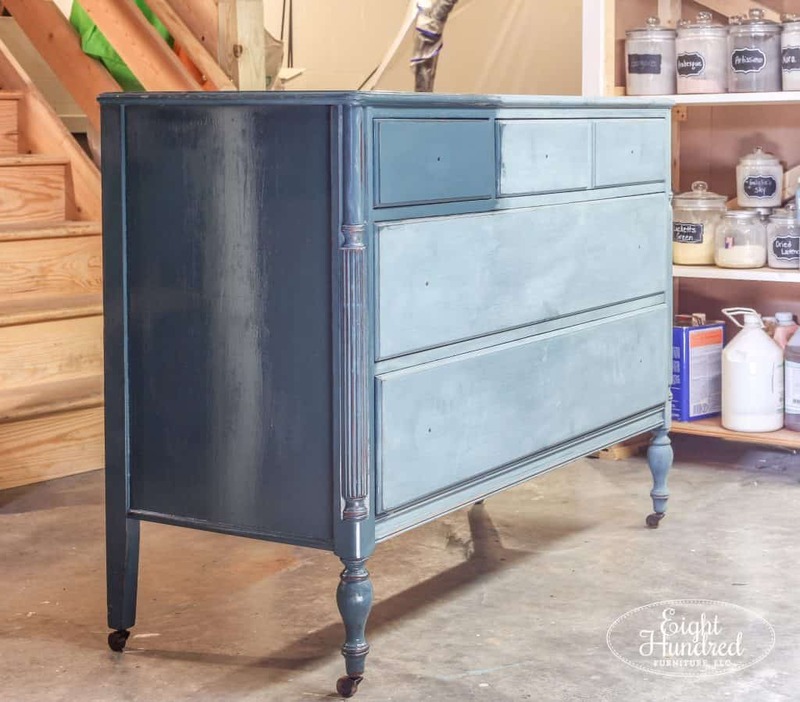 The milk paint was painted around the edges of the drawers, but I didn’t carry it onto the sides, as per usual. So I’ll be honest with all of you…I’m pretty proud of myself on this one. I allowed my creative juices to flow and followed the process as it took me along. It may sound a little “hokey”, but I let the piece run the show. I embraced how it played with all of the design choices I made and just kind of went with it all. 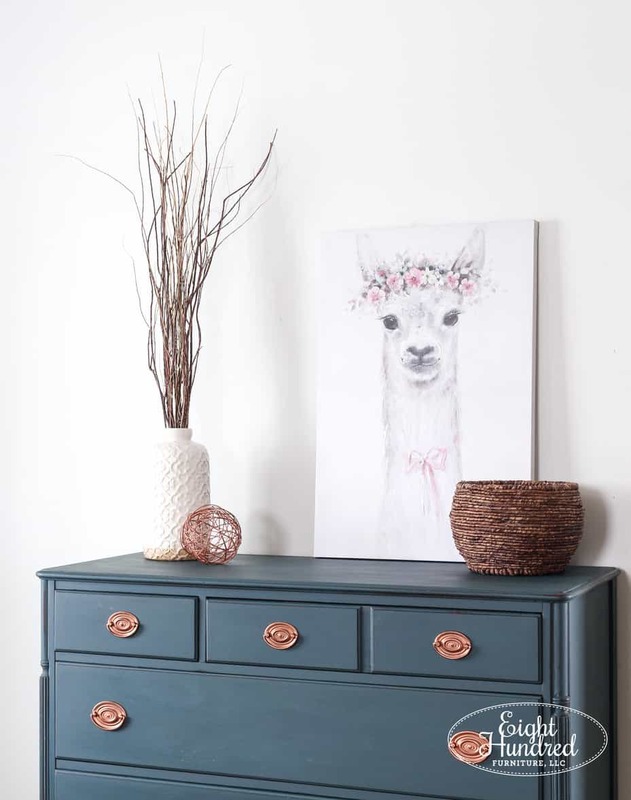 And come on…is this not the cutest little llama face you’ve ever seen?!?! This piece has come a long way since the 1940’s, wouldn’t you say? If you’re interested in this piece, send me a message. I’d be happy to provide more information on it! 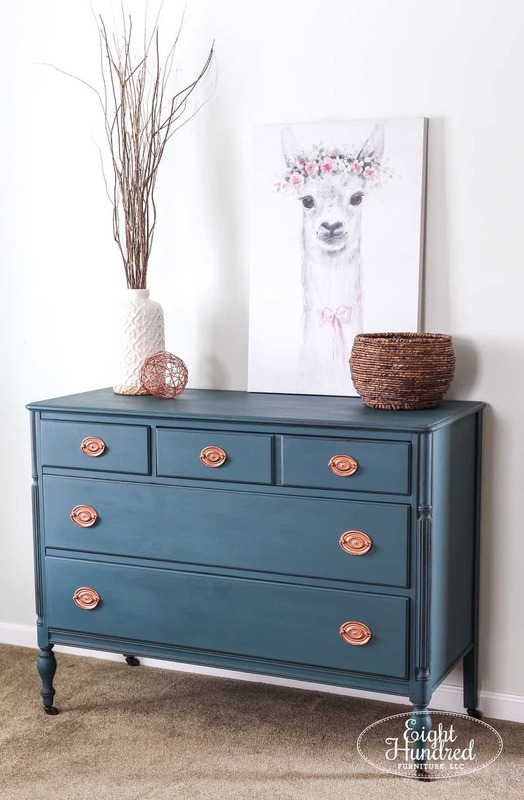 If you’d like to replicate this color combination on a piece of your own, my recipe was 2 parts Flow Blue, 1 part Artissimo and 1 part Boxwood by Miss Mustard Seed’s Milk Paint. Pick up these colors as well as a bottle of Hemp Oil from my display at Morgantown Market. And pin this guy for later!